Jazz Station - Arnaldo DeSouteiro's Blog (Jazz, Bossa & Beyond): Instrumental CD of the Month - "Mike Longo Trio + 2: To My Surprise"
Instrumental CD of the Month - "Mike Longo Trio + 2: To My Surprise"
With every new recording, jazz pianist Mike Longo digs a little deeper into the chemistry of the music, pushing himself and his band to more fully explore the intricacies of the rhythmic nature of jazz, attempting to go to new places where surprising results await. Longo named his new album "To My Surprise" in honor of those special musical moments that unfold. "To My Surprise," produced by saxophonist Bob Magnuson, features The Mike Longo Trio (with jazz stalwarts Bob Cranshaw on bass and Lewis Nash on drums) on a half-dozen tunes, and on the other six numbers the trio is supplemented with two special guests who are renowned horn players -- Jimmy Owens on trumpet and flugelhorn, and Lance Bryant on tenor saxophone. The music features Longo’s tight-arrangements of both his original compositions and several surprising selections of outside material, brought to a flowering fruition by the band’s inspired and deep improvisational exploration. The results are a stunning collection of acoustic modern jazz at its finest, rooted in the be-bop traditions of the past, but pushing into new territory, lessons Longo learned from studying with Oscar Peterson 45 years ago and playing with Dizzy Gillespie extensively for a quarter-century. 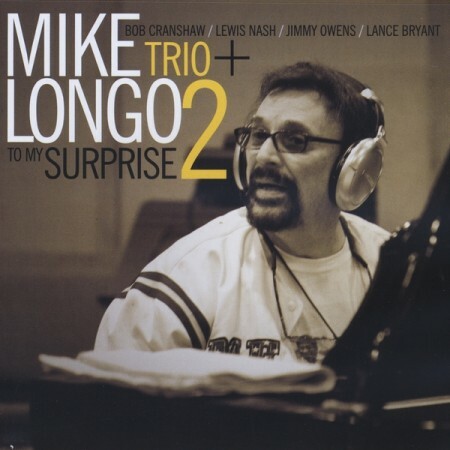 "To My Surprise" and many of Longo’s other recordings are available online at Jazzbeat.com and CDbaby.com as well as digital download sites such as iTunes, Rhapsody, eMusic, Amazon-downloads and many other online locations. In addition, Longo is revered as a master jazz teacher (he has written numerous textbooks) and he is just releasing his second instructional DVD (The Fundamentals) of an eventual four-disc series titled The Rhythmic Nature of Jazz. The first two DVDs are available at Jazzbeat.com. This new album showcases Longo’s always-evolutionary playing on a dozen tunes recorded “live in the studio, mostly first takes with the absolute minimum of editing” to capture the most spontaneous, rapturous, improvisational jazz possible (“We only had one rehearsal the day before to check song structure.”). Longo worked with this same trio on his highly-successful last album (Sting Like a Bee went to #3 on the international Jazz Week airplay chart). “Bob and Lewis are both from the same ‘polymetric school’ of playing where you can have more than one meter going on at the same time, ” Longo states. “With them and with the quintet there is a contrapuntal perfection between the musicians, plus a great action-reaction thing, a lot of spontaneous combustion with surprises going on.” Longo has performed with Cranshaw, Nash and Owens numerous times in various settings over the years. “Jimmy Owens and I first played together in 1968 in Dizzy Gillespie’s All-Star Band, ” Mike recalls. This latest CD is Longo’s first opportunity to play with Bryant. On "To My Surprise," the quintet tunes are original Longo compositions penned in the past year plus “Magic Bluze” which Jimmy Owens contributed. “When I was writing the material, ” says Longo, “I could hear the horns, so I scored some specific horn parts and also on each tune left sections for improvisational soloing.” The recording kicks off with the highly-energetic (and tongue-in-cheek-titled) “A Picture of Dorian Mode” followed by the slow “Still Water” with the piano echoing the horn melody line. On the title tune Longo took a left-turn by inserting a G-major-seventh chord (“that’s the surprise”), and it leads to Owens’ smooth trumpet solo followed by a rich-and-creamy sax solo by Bryant with the two horns playing different lines simultaneously near the end. Mike moved to New York and became a house pianist at the Metropole Cafe where he played with Coleman Hawkins, Henry Red Allen, George Wettling, Gene Krupa and other jazz notables. Eventually Longo also got to work with many great singers -- Nancy Wilson, Gloria Lynn, Astrud Gilberto, Jimmy Witherspoon, Joe Williams, Jimmy Rushing, to name a few. Longo did an extended stay at Embers West with bassist Paul Chambers accompanying acts such as Frank Foster, Frank Wess, Clark Terry, Zoot Sims and Roy Eldridge. In addition, over the years Mike has performed on albums by Dizzy Gillespie, Astrud Gilberto, James Moody, Buddy Rich, Lee Konitiz and many others. Dizzy Gillespie hired Mike as the pianist for the Dizzy Gillespie Quintet in 1966, a position Mike held through nine years of non-stop touring and recording, and for several years he also was the musical director for the band before striking out on his own. But even then, he worked frequently with Dizzy for another 16 years. “I was always learning from Dizzy. He had the greatest depth of understanding of rhythm of any musician I ever met.” While Mike was with Dizzy, the band recorded many tunes penned by Longo such as “Frisco, ” “Let Me Out, ” “Soul Kiss” and “The Truth.” Longo started his own recording career in the early Sixties and now has nearly two-dozen solo albums to his credit (three of them with his big band, the New York State of the Art Jazz Ensemble). Among his rhythm section’s multitudinous credits, Bob Cranshaw has played with Sonny Rollins, McCoy Tyner, Wes Montgomery, Thelonious Monk, Oscar Peterson, Ella Fitzgerald, Luiz Bonfá, Wayne Shorter and Joe Zawinul; and Lewis Nash has performed with Dizzy Gillespie, the Tommy Flanagan Trio, Betty Carter, Sonny Rollins, Oscar Peterson, Wynton Marsalis, Joe Lovano, Ron Carter, Danilo Perez and Claus Ogerman. Jimmy Owens has worked with Miles Davis, Dizzy Gillespie, Lionel Hampton, Duke Ellington, Maynard Ferguson, Thad Jones and countless others. Lance Bryant’s credits include Lionel Hampton, Abdulah Ibrahim, Jon Hendricks, Phyllis Hyman and George Gee.